THSC REVIEW is published quarterly in February, May, August, and November. We appreciate authors who are familiar with our magazine and its general content and style. We are interested in curriculum reviews as well as how-to articles that explore different approaches for various learning styles—in particular subject areas such as math, writing, spelling, history, good citizenship, etc. We welcome submissions that seek to encourage and inspire homeschool families. 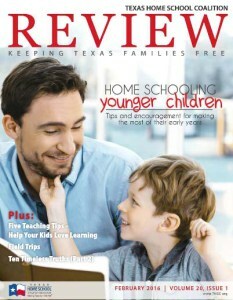 Articles should be of general interest to Texas home schoolers. The ideal length of an article is, for 1 page is 650 – 750, 1000 – 1250 for 2 pages. Send articles by email (attached documents are best). Please do not send PDFs. Include author’s picture and brief bio. (Ideal photo size is 300 dpi, minimum size of 600 KB) Articles should not promote any curriculum/company unless it is for a specific curriculum review. $100 for articles that have not been previously published and for which the author is willing to sell all ownership rights (including the copyright) in and to this article to THSC $50.00 for articles for which the author retains all ownership rights (including the copyright). These articles may or may not have been or will be printed in other publications. THSC will retain unrestricted rights to reproduce and publish the article in any format and in any media, including, but not limited to, any issue of the REVIEW with no additional compensation to the author.